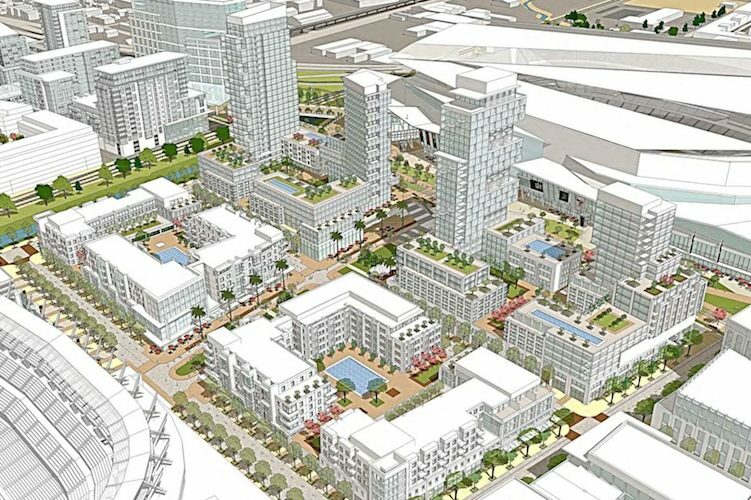 The renderings in the Coliseum City Specific Plan (co-mingled with the EIR) date back to July 2013. So far, no announcements have been made about architecture firms winning the business for any of the Coliseum City venues. With that in mind, when looking at the renderings don’t worry too much about how they look. They’re effectively placeholders, there to show the mass and complete the layout of the buildings within the plan. If you’re asking about a dome on the stadium or how many seating decks are in the ballpark – don’t bother. It’s highly subject to change. That said, we can look at a few aspects, such as how the ballpark is placed and oriented within the ballpark. That is the subject of this post. First, let’s look a bird’s-eye view from the south, with the entire project built out. The BART bridge is to be replaced by a much wider pedestrian concourse, connecting a better-connected transit hub, residential development at the BART station parking lot, hotels lining the concourse, and the broader development with the venues. The concourse will be built at what is currently 73rd Avenue, the street connecting San Leandro Street to the Amtrak Station. Doing this moves the dividing line of the complex further south/east, with the bulk of the developable land on the north/west side of the concourse. Several high rise condominium buildings flank the concourse where the existing Coliseum currently sits. The concourse is widest outside the football stadium and at 880, where there are two (!) bridges spanning the Nimitz. The Plan describes two levels of circulation: the elevated concourse and street level, where most of the buildings and the ballpark will be situated. Fans would descend stairs to the plaza that leads to the ballpark. There could also be a trolley or streetcar station at this intersection. The plaza and the four blocks surrounding it are the focus of what is called the “Next Generation Sports and Retail District.” This area would be closed to cars on event days, allowing for a big party zone between the two venues. Should Coliseum City come to fruition, there won’t be anything like it in the country, with two or three venues anchoring a big district. It would also be huge for the City if the large swath of commercially-zoned property slated to be office/R&D could be put together as a potential campus for a large tech company. Right now all of that activity is focused on the Peninsula and the South Bay, with Google, Apple, and Facebook devouring huge tracts of land for future expansion. At the moment Oakland is a few degrees removed from such activity, but that’s where they should be thinking. I’m still not a big fan of orienting the ballpark to the northeast. While that’s proper in terms of MLB guidelines, the orientation turns its back on the plaza and feels like a missed opportunity. It would be nice to have people walking along the plaza be able to see into the stadium, the way you can from much of the Gaslamp District in San Diego. The idea is to fully integrate all elements of the plan, and this is a miss. There is a publicly-accessible area of the ballpark beyond centerfield, where a Park-at-the-Park like grassy knoll provides views. But getting there requires walking along the edge of the complex, along a perimeter road, past a hulking parking garage. It’s not the friendliest or most accessible approach. A nice side effect of this approach is the fans traveling south on BART will get a good look at the ballpark as they arrive at the Coliseum (City?) station. Operation and scheduling use of the Ballpark would be restricted from having major events (including baseball games) on the same day as football games at the adjacent Stadium. Since no large events could occur simultaneously, parking for the Ballpark would be accommodated within the same on‐site parking facilities as used by the Stadium including the 3,240 surface lot spaces and 7,500 dedicated event parking garage spaces. The Plan calls for more than 18,000 parking spaces, an 8,000-space improvement over the current complex. 13,000 of those spaces would be in garages, and of those spaces 5,000 would be off limits because they would be slated for hotel and residential use. The net gain for event use, if some of the office parking is used, is an extra 3,000 spaces or 13,000 total. Despite the great reduction in available tailgating space (only possible 3 surface lots totaling 4,200 spaces), a parking restriction like the one described above would remain in effect. That would limit the ability of schedule makers to freely assign weekend home series for the A’s in August, September, and October. It also shuts out any possibility of going to both Raiders and A’s games in the same day within Coliseum City: an A’s game at 1 and a Sunday night Raiders game at 5, or vice-versa. It’s better than sharing a field, I suppose. This entry was posted in Baseball, Coliseum, Feature, Oakland. Bookmark the permalink. Agreed that a tech company corporate campus would be a huge part of actually making it happen and a boon for Oakland. I’d LOVE to live, work and watch the A’s all in one neighborhood. I’d probably be abandoned by my wife and kids, but… It is the A’s. That would be so incredible, I hope whatever form this project takes on (800 acres probably a little too ambitious), that it would incorporate the idea of open work campuses. There seems to be a shortage of such styles, within the inner Bay Area and something a project like this could capitalize on. Man, just the description of what’s possible with the concourses alone, is cool. The real question is how many years the ballpark location would sit empty while the Raiders built in Phase 1. Not that I think it matters. I am wholly unconvinced that development will ever occur with both teams, to say nothing of that new arena silliness across 880. I don’t know how many people, actually believe this project will reach full build out, which would include two new stadiums and a new arena (with the Warriors moving to SF), in any event it does present exciting possibilities for a scale down version, with the A’s and ( or ) the Raiders in mind, of course that would require a real commitment, by the A’s and ( or ) the Raiders, as well as the city and county. Mark me down as “none of this will ever happen” but I am glad to be wrong, if I am. ^agreed. until i see a shovel hit the ground i’m skeptical about a project of this size and complicated getting built within the next decade especially when you look at the ineptitude of the oakland politicos. I am also very skeptical that this project will ever come to be. However, I do believe that a much more scaled down version is still possible, but with containing only one new sports facility. I believe that having a MLB ballpark at the site will be the most economically feasible and practical, as opposed to having a limited ten plus even date football stadium. I understand that the project is considering a roofed football stadium as the way to significantly add to its event usage. However, I don’t believe that a roofed football stadium is conducive to the moderate ideal climate and weather conditions of Northern California, not to mention the significant added costs for building such a structure. I was wondering about the concept of a roofed stadium myself, it not only seems odd from a weather standpoint (considering the climate in that part of the east bay), although as I understand it, a roofed stadium would be targeting larger concerts or conventions, but is there really that big of a demand for such events? It’s seems that most of the really large companies, or whole industries that create the demand for conventions have either scaled back, or have already locked themselves into a cite or city ( Chicago, Tampa), for several years in advance. It also seems there is less demand for the outdoor larger scale music concerts, how many of those things even happen in a year? On top of that even when they do, I could see those act’s preferring to preform, on a summer evening at dusk in Santa Clara. The added cost just doesn’t seem to justify, what little demand is out there for hosting such large events. As you know I still believe (hope), that two new stadium venues is a possibility, but if only one can ultimately be accomplished I agree with you, for all the reasons we have discussed it needs to be a MLB baseball park. You just open the roof for football and then close it for nighttime conventions and concerts. Yeah man, I get the concept. You keep the roof open for NFL football game’s and you close it for night conventions, large concerts, truck pull\monster car events and the like, you may even get an international soccer game from time to time, as I think you mentioned. I just think when you factor in the extra cost of a retractable roof, to a stadium that’s A.) for the NFL (which means your not doing it for the football team, because they will play in the rain regardless) B.) You have direct competition already in your market, with Santa Clara, for C.) a minimal amount of events that both venues would be competing for. It’s a nice idea, but I don’t think the added cost, which again could amount to as much as one fifth of your total cost for the stadium project would be justified, but you could be right, it certainly won’t be the first, or last time I was wrong. It’s a slick looking concept. However, It appears to be 100% unacceptable to Wolff and the A’s – who have been very clear that they have no interest in leasing, and that they must own the land develop it themselves. Also, the new MLB commish appears to be very un-Selig like – possibly a very decisive, no b.s. type of commissioner. It’s possibly the A’s stadium situation will be settled very quickly once Manfred takes over. This is a fantastic development. If this ever comes to fruition it would transform East Oakland as we know it. Marine Layer, I agree with you regarding the ballpark turning its back on much of the development. It would be nice to have an open and integrated connection to the ballpark. I do love the scope of the development in its entirety. Certain aspects need to be fine tuned but the concept is really incredible. The football stadium should be built with FIFA regulations in mind in order for Oakland to be able to host international soccer matches in the same manner Levi’s Stadium is currently able to do. The stadium would need to be utilized much more than just ten times per year and soccer matches along with large concerts would do that. 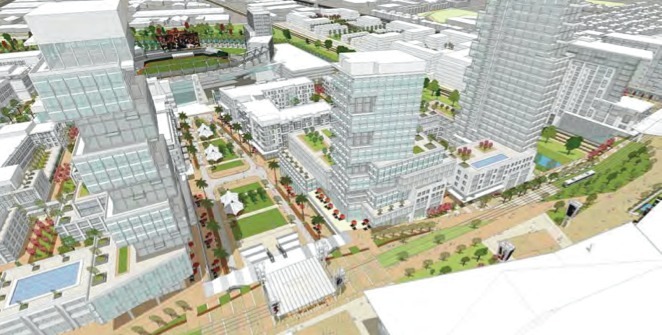 Aren’t these renderings for Coliseum City irrelevant if the Raiders are not on board? The Raiders are in free lance mode and probably won’t announce their real intentions until after the 2014 season. Matier and Ross reported that the basics of the deal had been agreed to by the Raiders. Let’s see if Mark Davis will formerly commit to the development. If Davis really wants a football stadium in Oakland like he said he did, then this is his best and only chance. If Mark Davis wants it built in Oakland, he will. However, I have a hunch his true intentions is to leave the City of Oakland. The behind the scenes negotiations, have the possibility of being anything but irrelevant. I think that’s the point. 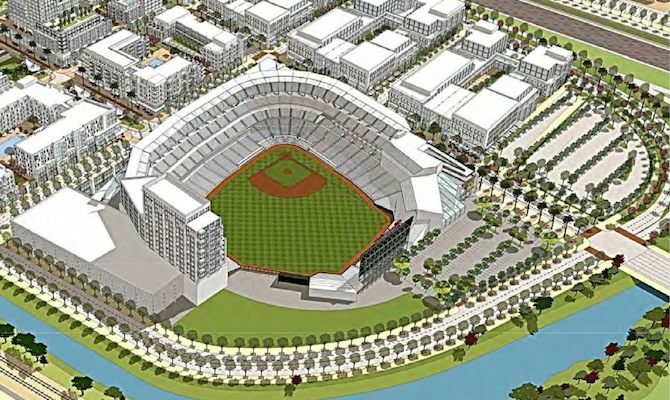 not weather coliseum city will ever reach full build out, but that a scaled down or modified version of this project has the potential to retain the A’s and (or), the Raiders. No harm in looking at ideas and concepts, you never know when the brilliance of ML, may come up with a new idea, much like when he introduced the idea of the A’s and Raiders splitting the coliseum footprint down the middle, without expanding the current footprint much, while allowing for two new venues and retaining a good about of space. As nice as that was, we have no idea how the Raiders would get to the funding level they would need to build (which he explained), still among the one thousand unanswered questions, but if we let unanswered questions keep us from looking at possibilities, then we would not be here at all. I just have a feeling both the Raider’s and A’s are just checking the block to satisfy both league offices about making an attempt at getting a stadium deal done in Oakland. MD does not have the cash and the market does not justify building a new football stadium in Oakland. As for the A’s I think they are going through the motions for PR purposes and doing what the league told them to do before the lodge will allow relocation to be brought up at the owner’s meeting. You could be right, there remains a real possibility that Oakland could lose all three teams. It would be devastating if they lost the Raiders and A’s, especially if the A’s never gained access to San Jose, because that would mean more then likely both franchise’s would be lost from the Bay Area all to gather, at least we know in the Warriors case they are not even considering another market, unlike the Raiders whom seem to consider other markets even when they are doing well (20 straight years of sale outs before first LA move), and the A’s whom more then likely will be forced to consider it (by sale), if they can’t gain San Jose and they decide, for whatever reason they can’t or won’t, build in Oakland. I’d agree on rotating the park towards more of the eastern direction but would orientating the baseball park in that direction in those renderings high that “stream” or “river” that’s beyond the stadium? not that’d it come close to duplicating at&t or even other waterfront parks like cin’s gabp and especially pit’s pnc but i could see the city of oakland wanting some aspect of a water view highlighted by the design. You can still have Damon Slough (the creek) there if the field is rotated 90 degrees. The waterfront effect is already diminished by the loop road that runs along the perimeter and the great deal of buffer space. Damon Slough is also not exactly very wide (60-100 feet). Even after the waterway is cleaned and prettied up, it’s not big enough to look very impressive. What would be impressive would be to place the ballpark on the waterfront on the west side of 880. That’s the area near MLK Shoreline Park with a very nice Bay view. That site would allow more pedestrian activity through the entire project as people filled from the Bart station to the ballpark. That area is meant to be open space. Building there requires dealing with the Port, BCDC, SLC, and other agencies. Not gonna happen. I have a question for you, (anyone fill free to answer), Let’s assume for a moment that Oakland/ Alameda County will not be able to acquire the whole 800 plus acres that coliseum city would need to to reach its goal, and we were only working with the land we know is available. ML mentioned that of the 535 available acres, half of it could not be built on in a profitable way (ROI), so we are talking about roughly 270 acres (still a lot of land), of the project that can be built on in a profitable way, and roughly 265 that for a verity of reasons are not going to be as easy to utilize. Can you think of any ideas to utilize the 265 acres in an, inclusive way to help the parts of the project, that can be built on easier? (270acres), perhaps in ways that has the potential to even add to the profitability of the portions of the project that will have to make money? Idont know if an aquarium (perhaps out door), can be built on or near those wetlands, anyway I was only wondering if you had any ideas. Why is Abad not the closer? The guy throws 93MPH and has a devastating slider. Melvin brings in Cook who is up and away to every left handed hitter. Cook does this all the time agains left handers and the pitches aren’t even close. And then Melvin walks the second baseman and puts pressure on Abad to throw strikes with the bases loaded, In addition to putting pressure on your pitcher you also take the risk that he’ll lose the strike zone. In that situation you challenge the hitter and I don’t care how good he’s been in the past. This was boneheaded managing of the highest order. Between Beane’s irresponsible trades and Melvin’s recent poor managing this team is done. We’re going to miss the playoffs. Abad, has the best stuff out of the bullpen and they refuse to make him the closer until Doolittle gets back. Melvin put Abad in a bad situation today after Cook messed things up. Total melt down, we may not make the playoffs at all. @all – There are plenty of other places to talk about the game. Please refrain from doing so here. This is not an open forum. That’s the way Cook-y crumbles. I think all the land there could be developed in various ways. You have the high density housing, hotels, parks, parking garages, light R&D campuses on the other side of 880, transportation hubs, distribution centers for air freight companies, more airport hotels, more restaurants, an added station on Hegenberger for the Bart airport connector, a more recreationally developed MLK shoreline similar to Mission Bay in San Diego, etc. Keep in mind that this is very valuable land right in the middle of the Bay Area with its own Bart station and with a connection to Oakland International Airport. The Oakland Airport Business Park off of Hegenberger is growing and justed added a very large light industrial project which is seeing very strong leasing activity. We have UPS, FedEx, and a number of other companies with huge distribution centers. This area is still tremendously under valued because of a certain stigma associated with the area. The reputation is based mostly on fear, ignorance and racism. The crime which exists is mostly between people who know each other and are fighting over crumbs in the black market because of their economic condition. The crime is no worse than any other low-income area. Most of the people in these neighborhoods are hard working people who want the best for their families. The bottom line is the property is discounted based on biases from the moneyed classes and anyone who is willing to believe in the area and make the investment can reap huge rewards. Thanks, for the response. I agree with you concerning the area being undervalued, and I think with the BART station/Airport concoctor, there are some real possibilities for future growth. It’s also exciting to see what’s started to happen on the other side of 880, as you mentioned. ML, specifically mentions MLK Shoreline Park (yes nice view), as meant to be open space and listed several different governmental agencies, that would have to dealt with just to see what could be done there. Unfortunately, I don’t see Lew Wolff going through that much trouble, even if he could build close to the shoreline, after all if he ever builds at the coliseum site, it will be because it’s the path of least resistance, not his preference. I realize there are a few things in that area but, I was thinking more along the lines of what might be suitable, for a wetlands area that could also help spur growth in and around a potential new ballpark. I guess as ML, reminds us from time to time “Do your homework”, which I admittedly have not done, so I’m going to look into it a little further, but again thanks for the response. As far as stimulating more growth I would go with the recreational use of MLK shoreline and turn it into more of a regional attraction similar to San Diego’s Mission Bay. Boat rental, marinas, bike paths, watrr skiing, more hotels, etc. San Leandro Bay is a very beautiful area many people don’t know about. The area is under used and under developed for its recreational potential. Marketing this area for this type of use could help change the image for this part of Oakland and help with the entire Coliseum City project. Thanks again, I really appreciate the reference to San Diego and Mission Bay, I think it really has that sort of potential.